The American Medical Association once stated, “the nurse should be a woman who possessed so many positive traits that she was virtually perfect” (Hines). If perfection did exist, it would take the physical form of Mrs. Fostine Riddick-Roach. Mrs. Roach is not an individual that graces school textbooks or someone mentioned in an African American Studies class. However, her contribution to nursing is insurmountable and her achievements as a Black woman should be recognized. Maiden Fostine Mae Glenn, the third of eight children, was born in Elmore County, Alabama on May 12, 1918. At the age three, however, Mrs. Roach relocated to Muncie, Indiana with her mother, father, and two siblings. Her mother and father were not satisfied with the school systems in Alabama and wanted their children to receive the best education they could provide, thus provoking their move to Indiana. There Mrs. Roach received similar education as adolescents today. She attended pre-school, equivalent to modern-day Kindergarten, through 12th grade in Indiana. She graduated from Central High School in 1936. While prejudice and racism were common attitudes during this time, Mrs. Roach says her schools were integrated. This was not the case with neighboring schools in larger cities as Indianapolis. She did add, however, that there were only about 13 Black students in her high school. With so few blacks, the school systems did not find it feasible to create separate schools for the minority. It was during her time at Central High School that a passion for nursing began to develop. Mrs. Roach says she knew she wanted to be a nurse. She did not know exactly what it was she wanted to do with nursing or how far it would take her, but she had an intense desire to care for others. During her senior year of high school a profession in nursing became tangible. After graduating with an exceptional grade point average, Mrs. Roach was qualified to attend any institution. The difficult task was gaining admission despite her color. For this reason, she did not attend Ball State University in Muncie, Indiana. Instead, Mrs. Roach attended Tuskegee Institute after her father’s persuasion. Following high school, Mrs. Roach attended Tuskegee Institute to become the “trained nurse” as Dr. Daniel Hale Williams would have envisioned. Nursing school at Tuskegee was rigorous. The three-year program contained general requirements in courses like Chemistry and Biology while also putting students through clinical simulations. During this time many Black medical schools required their students to have clinical training. This change was also reflected in Black nursing curricula. For Mrs. Roach, training took place at John A. Andrew Memorial Hospital located on the Tuskegee campus. Nurses in the hospital had grueling hours and performed many tasks. To some doctors, nurses were seen as cheap labor to complete the tasks that their schedules did not permit. Mrs. Roach says she lived through these descriptions of nursing duties. While at John Andrew Hospital, she says the nurses did everything including laboratory technician jobs. However, as programs began to grow, nursing duties became separated. Mrs. Roach completed her three years of nursing school graduating in 1939. Upon graduation, Mrs. Roach received numerous job offers. Black hospitals in the late 30s and 40s wrote Black nursing schools offering jobs to exceptional nursing students. Many of these hospitals only hired the best and most qualified nurses following the ideas of Dr. Daniel Hale Williams. Tuskegee Institute received a letter from Norfolk Community Hospital offering two nursing positions: Laboratory Technician and Nurse Anesthetist. Her professor suggested that she take the Nurse Anesthetist position due to her class and clinical performance. In 1939, she claimed the job and headed to Norfolk, Virginia. She wants to have it known that there was “no other person in the city of Norfolk that was a Nurse Anesthetist, but me”. Mrs. Roach’s accepting the job offer at Norfolk Community Hospital was the catalyst to her nursing career. During her first year at Norfolk Community, Mrs. Roach joined Chi Eta Phi Sorority, Incorporated: an action of pure coincidence. A doctor from Washington, DC held a meeting with nurses to discuss starting a Norfolk chapter of Chi Eta Phi. Mrs. Roach attended the meeting even though she was not permitted. She became one of the charter members of the Norfolk chapter of Chi Eta Phi Sorority, Incorporated as a result of this meeting. Mrs. Roach stayed at the hospital for only a year before she requested a leave of absence to pursue a master’s degree. She obtained a master’s degree in Administration and Medical Surgical Nursing from New York University. The mere act of her graduating from a prestigious master’s program made her sought after by many organizations. Mrs. Roach returned to Norfolk, Virginia and was offered the position of Director of Nursing at Norfolk Community Hospital. She held this position from 1955-1963. She also served on the State Board of Health. She was the first Black woman, and woman period, to hold such a position. Mrs. Roach went on to serve on several national boards. The most notable of Mrs. Roach’s positions came in 1963 when she became the Director of Nursing at Hampton Institute (now Hampton University). From Hampton, she retired as Dean of the School of Nursing. She also holds the title of Professor and Professor Emeritus. As Professor Emeritus she was able to return to Hampton University to attend President Barack Obama’s commencement speech. Mrs. Fostine Riddick-Roach is a gem. Her contribution to nursing is like none other. Mrs. Roach has obtained many prominent positions within the nursing profession. In each of these positions, she strived to encourage young, Black women to pursue the nursing profession. She wants to increase the number of Black women in the medical field, and her work within her positions displays this desire. When she was a student at Tuskegee institute, Black women did not have many opportunities afforded to them. Nursing was one of the few professional jobs for Black women. While some individuals appreciate the contributions of individuals like Mrs. Roach, it is painful to see numerous Black women denounce a once sought after field. At 96 years old, Mrs. Roach has lived through many of the topics discussed in this course. She was a student in Tuskegee Institute’s rigorous nursing program. 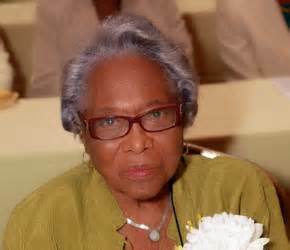 She witnessed the movement of Black hospitals, and she was apart of the push for Black nursing organizations. Her relevance to the Black health profession cannot be ignored. Mrs. Roach has been an inspiration to me, and a great mentor. Call me an old soul, but I love hanging out with her just so I can absorb her wisdom. Through this interview experience, I have gained first-hand insight about African American health professionals and a greater appreciation for the labor of women such as Mrs. Fostine Riddick-Roach. Member of Chi Eta Phi Sorority Inc.